1 small eggplant cut into 1/2 inch pieces. I left the skin on but if you wish, you can peel it. Also I salted it in a colander and let it sit for at least 30 minutes. After I rinsed it. 4 or 5 large mushrooms, sliced. In a 9 X 14 inch Pyrex or other oven proof dish place ingredients 1 through 5 and drizzle with the olive oil. Roast until golden brown and tender. (about 45 minutes) About half way through, I stirred the veggies well. In fact, you can stir even more times if you wish. Brown the optional lamb, etc. in a bit of olive oil in a skillet stove top. Set aside. When the veggies are roasted, take your dish out and stir in the seasonings in # 7, the tomatoes and their juices in # 8, the basil leaves in #9 and the parsley in #10 and the optional ground meat in #11. Bake in the 400 F oven with a foil covering for 20 to 30 minutes till hot and bubbling. Now’s the time to top with the cheese and bake without the foil for another 10 minutes—or at least till the cheese is melted. I actually turned on the broiler for several minutes to get it browned. Alternative method of serving: If you didn’t add the meat and maybe want to add eggs to this dish, then before you add the cheese, make four indentations in your veggies, break in an egg and layer the cheese over all. Bake uncovered until the eggs are set and the cheese is melted—8-10 minutes. 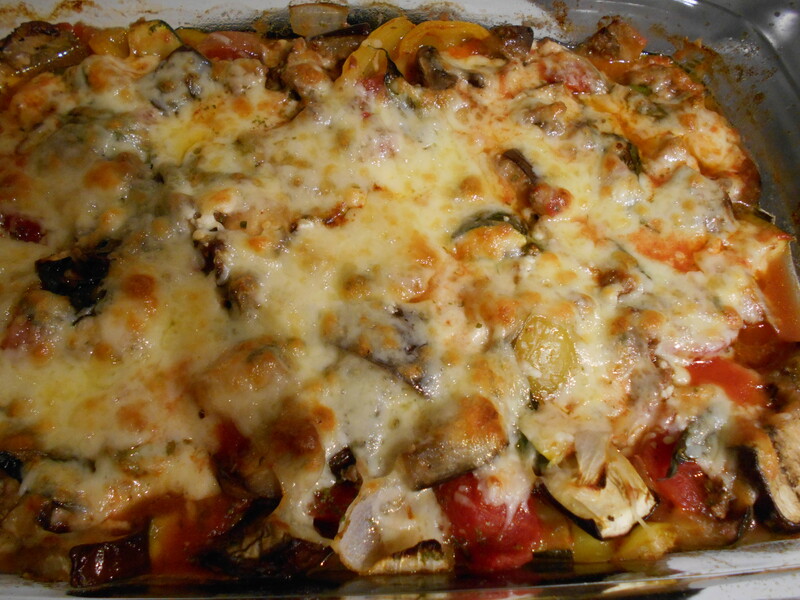 Another alternative for this dish: If you did use the meat and you’ve layered the cheese, and cooked it that way but still want an egg on top—fry the egg in a separate pan and when you serve the Ratatouille, place the egg on top. Plenty of protein here and it really is good. 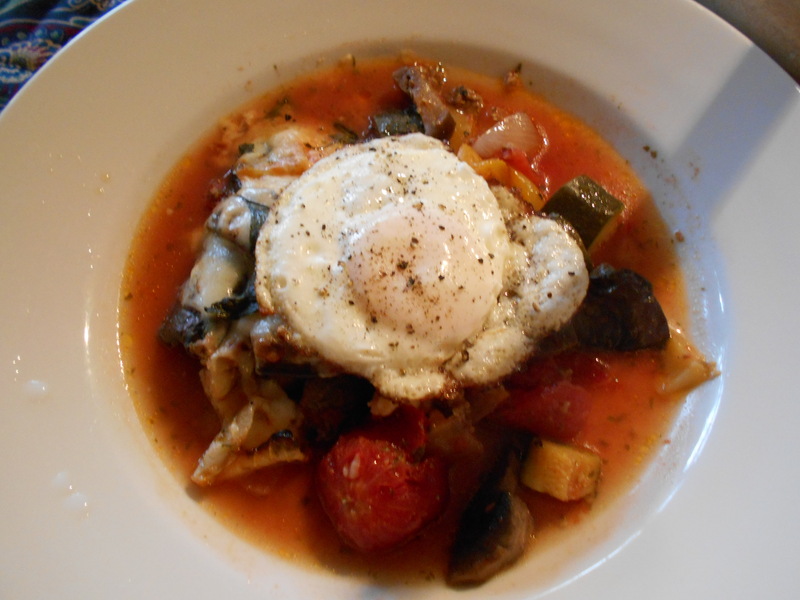 Remember, you can serve the left over Ratatouille (if you have any) for breakfast topped with an egg.